MUZAFFARABAD, Pakistan (AP) — An old wooden bridge over a fast-moving river in Kashmir collapsed as dozens of students were taking pictures on it, leading to at least five deaths on Sunday. 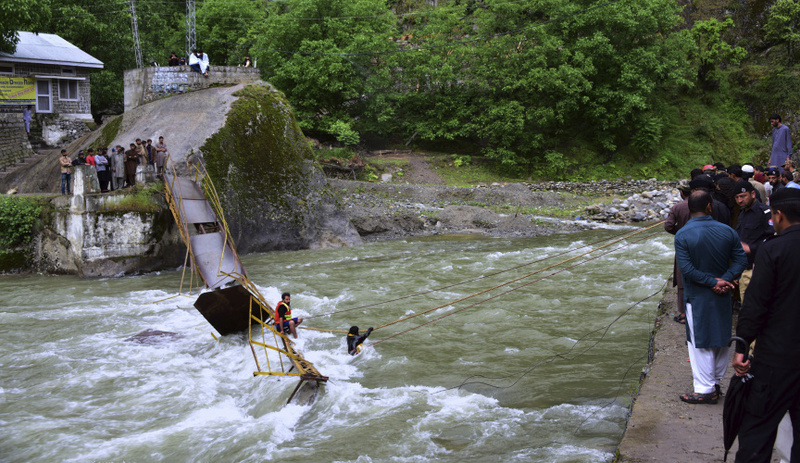 Javed Ayub, a senior tourism department official in Pakistani-administered Kashmir, said 14 students were rescued after the bridge collapsed and that civil and military rescue teams were searching for 11 others. Ayub said rescue workers recovered the bodies of five drowned students. The students, most in their early 20s, were enrolled in the medical college at Faisalabad in eastern Punjab province. He said some students from a college in Lahore were also among those who fell into the river. Ayub said the hanging wooden bridge was designed for locals to use in small numbers. "The touring youths have not realized the danger despite a warning board asking people not to overload the old structure," he said. Police official Mohammad Siddiq said eight of the rescued students were injured and airlifted to Muzaffarabad in a military helicopter for medical aid. He said the incident took place near the picnic point of Kundal Shahi, some 75 kilometers (approx. 47 miles) north of Muzaffarabad, the capital of Pakistani Kashmir.